In late 2017, Maison Villevert re-launched G’vine Nouaison. The earlier version was among my favorites at the time I reviewed it. Since then, it’s been re-imagined at a slighter higher ABV than the original. Similar to other offerings under the G’vine brand, Nouaison also is built on a base spirit distilled from grapes. Among the fourteen botanicals are several which are more frequently seen in perfume than in gin. Sandalwood and Vetiver are plants native to the Asian continent and are both widely valued for their intense aromatic qualities. Nouaison might be said to be a drinkable perfume on some level. Though for all of the showy botanicals, the top note of G’vine Nouaison is that of the delicate grape. Citrus dominates the middle notes, with a woody and peppery nuance. The nose is warm and inviting. Sipping Nouaison, the first thing you will notice is that with the slight increase in ABV comes a touch more heat than in other G’vine offerings. There’s a hint of coumarin early on the palate, similar to Bison Grass or sweet grass. Peppery spice in the background complements piney, woody juniper. Ginger, coriander and especially nutmeg come through to the fore here. Towards the finish, Nouaison is woody and warming. Fans of wood will get bright hints of birch bark, pine hearts and peppery cubeb. Nouaison has a thick, unctuous mouth feel. The spirit holds tightly to the palate; the flavor continues to evolve and provides a rich warmth as well. It’s smooth but a bit hot. And absolutely delightful. This gin was designed to be a cocktail spirit. And for all of the unusual botanicals— it’s really two things that come through in most drinks: juniper and spice, and the rich texture of the base spirit. Nouaison makes a nice Martini with some earthiness in the finish. I almost think that this gin works so well neat that it might be best suited to the Extra Dry Martini. It adds a woody character to a Gin and Tonic, which while not completely unwelcome, it does differ quite a bit from your standard G&T. That being said, this spirit holds up delightfully to some of the darker, heavier Tonic Syrups on the market. 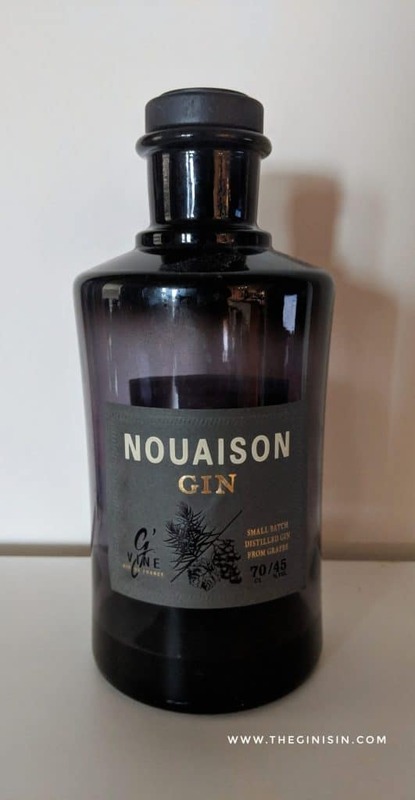 But overall, with few exceptions I found G’vine Nouaison to be a good mixing gin that worked well with a wide range of ingredients and provided a nice, contemporary gin character. In that way, this gin celebrates a subsequent metamorphosis: from luscious grape berry to luscious base spirit. Fans of classic style gin will find that rthe 2017 incarnation does dial back the juniper and tweaks the recipe ever so slightly towards the contemporary, while playing up the smoothness of the base spirit and playing down the flavor of it.